An hilarious dinner theatre show over 2-3 hours performed by highly experienced comedians. Ideal for staff Christmas or mid-Winter parties, theme parties, conferences, restaurants, team building, cabaret evenings or many types of corporate and private functions and events. An Evil Genius is trying to destroy your Christmas. They are doing everything they can to make people miserable so MI6 is sending in James Bond, licensed to entertain. He will be accompanied by M or Miss Money Penny, or both for larger audiences. 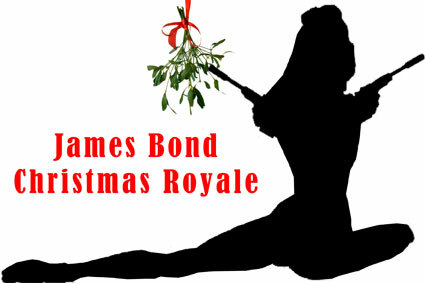 Guests will be inducted into spy school and challenged to certain tasks which may include, a short James Bond Quiz, lessons on sophistication, looking good while playing baccarat... and some self-defence moves that James just thought of. On top of all that, the ladies will learn the art of seduction with the cunning use of mistletoe. After training, the Evil Genius is sure to be thwarted by the guests and sent packing. This show is recommended for groups of 50-150 guests. "Very well organised and executed"
- Michelle Garrick, Savory Construction on one of our Combined Christmas shows.